The reason gondolas came about is straightforward. Venice is a city built on some 100 islands and in the early days, there were few bridges between the islands. Thus, if you wanted to go from one part of the city to another you had to go by boat. Indeed, even after bridges became more widespread, the fastest and most direct way to get from one place to another is by boat. Because of the mud flats around Venice, to be practical, a boat had to have a shallow draft. At the same time, the water in the canals is quite deep in places. Therefore, a boat like a punt, which is propelled by pushing a pole along the water bottom, would not work in Venice. Although some say that the gondola dates back as far as the 7th century, the first documentary evidence of gondolas dates from 1094. 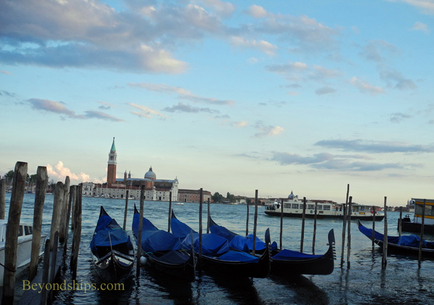 Their heyday came in the 18th century when there were as many as 10,000 gondolas in Venice. Not everyone used these boats. Rather, they were transport for the upper classes similar to limousines. 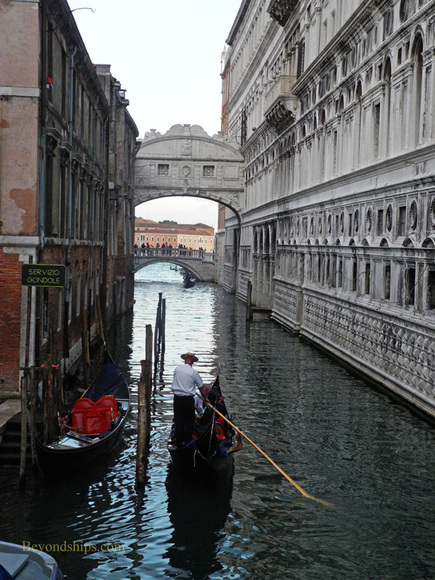 Everyday folk who wanted to cross a canal used the gondolas da parada or traghetto - - essentially ferry boats. Those ferries still exist today, taking people across the Grand Canal for 50 Euro cents. Gondolas have evolved over the centuries. In the past, it was not uncommon for gondolas to have several rowers propelling the boat through the water. Some had cabins called “fetze,” which served to protect the passengers from the elements and to shield them from onlookers. Venice, of course, was the home of Casanova. 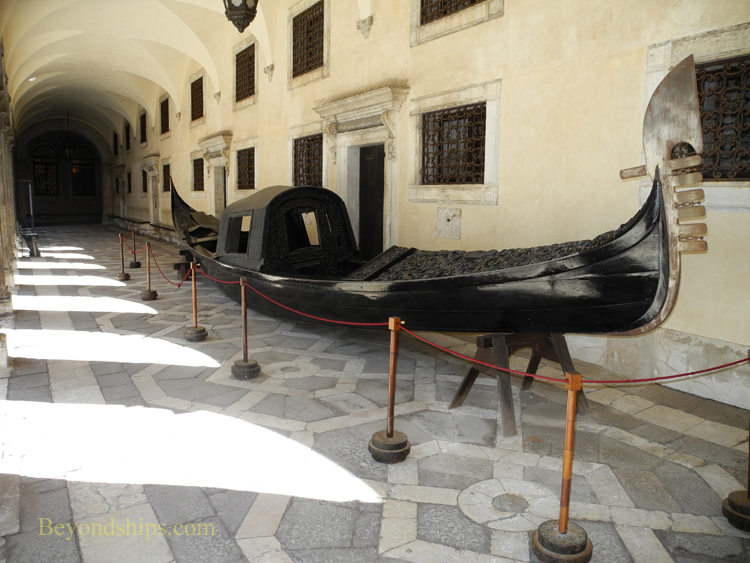 In 1572, competition to have the most ornate gondola became so intense that the Venetian government stepped in and decreed that all gondola had to be black and that continues to this day. Despite this rule, some gondolas are more nicely appointed than others. Until, the 19th century, gondolas were symmetrical. Then, it was realized that if the port side was about 10 inches longer than the starboard, the boat would resist the temptation to turn to port each time the gondolier made a forward stroke with his oar. This made life easier for the gondoliers and so all gondolas today are asymmetrical. 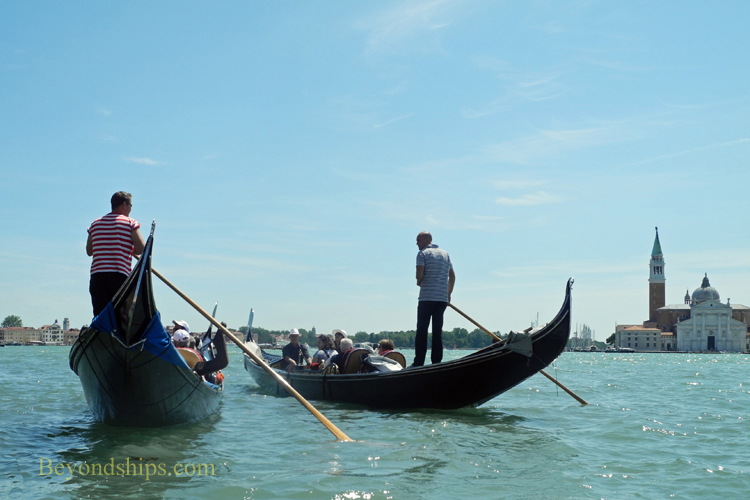 Cruise ships calling in Venice usually offer a gondola ride as a shore excursion. The chief advantage to booking through the ship is that everything is arranged for you and all you have to do is enjoy the ride. However, it is also possible to go to one of gondola stations located around the city and hire a gondola independently. The fares are set by the government. Visitors sometimes report that they were able to negotiate a lower price. But they often find that the lower price means a shorter voyage. (The standard voyage is about 40 minutes). Therefore, it is best to agree upon the price, the length of the voyage and where you will go before embarking. Prices rise at night. This is primarily because of the demand for a romantic moonlight gondola voyage. They say thousands of people become engaged on gondolas each year. 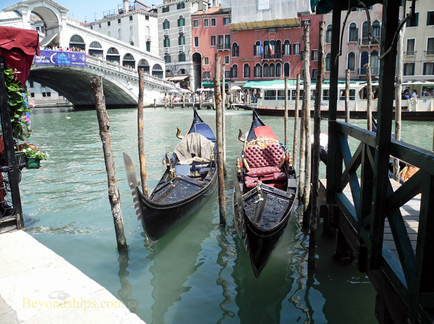 If possible, talk to the gondolier beforehand rather than a ticket agent. 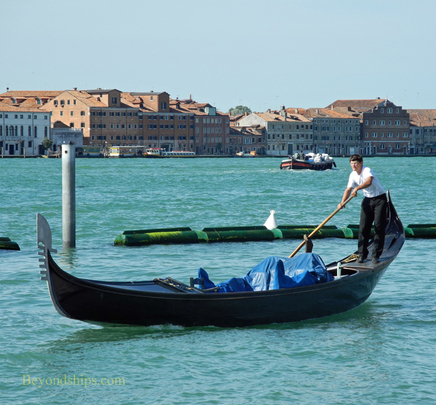 As with guides and taxi drivers, the personality of the gondolier will affect the experience. Find someone who you feel is congenial and who understands what you want. If you are looking for a romantic voyage, you probably do not want a gondolier who will be chattering on about the buildings you are passing. If you are looking for a tour that will increase your knowledge of the city, you do not want someone who will stand in the back silently rowing the boat. Again, it should be noted that a gondola ride is not inexpensive. Gondolas still exist only because of the tourist trade. 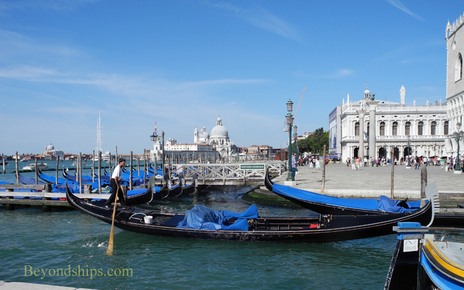 Locals wishing to get around Venice use the vaporetto water taxis or the aforementioned gondola da parada. While it may sound like the thing to do is to take a gondola ride along the Grand Canal, such a voyage may not be as memorable an experience as sailing the back canals. Gondolas do not have stabilizers and these relatively narrow, shallow draft vessels can roll rather alarmingly. In the busy Grand Canal, they can encounter the wakes of the vaporettos and other motorized craft. 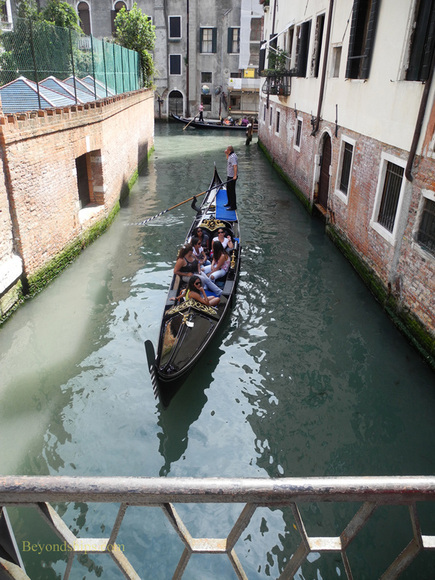 Thus, the gondola are much better suited to the placid waters of the uncrowded back canals. But the best reason for taking a voyage through the back canals is the beauty of what you will see. Ancient buildings with a timeless quality. Picturesque bridges spanning the canal. Around a corner, a hidden palace or more commonly a Renaissance church springs into view. There is a serenity about it, away from the crowds. Few vessels are as closely associated with a specific city as the gondola is with Venice. The image of these small, intimate craft gliding through the canals with passengers seated amidships and the gondolier standing aft has been described in countless novels and seen in a multitude of movies. Venice would not be Venice without gondolas. 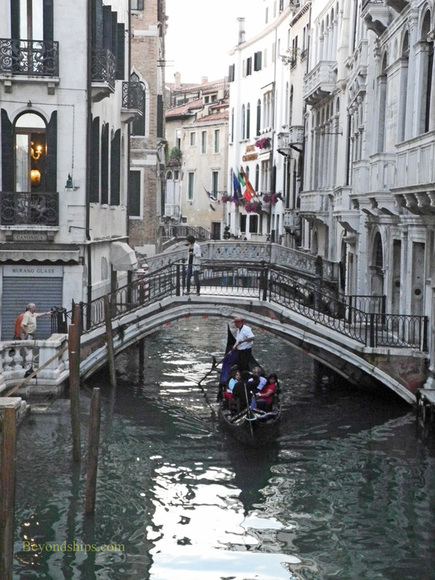 Consequently, for travelers cruising to Venice, a ride in a gondola is a must. Yes, it can be argued that such rides are for tourists and that they are expensive. 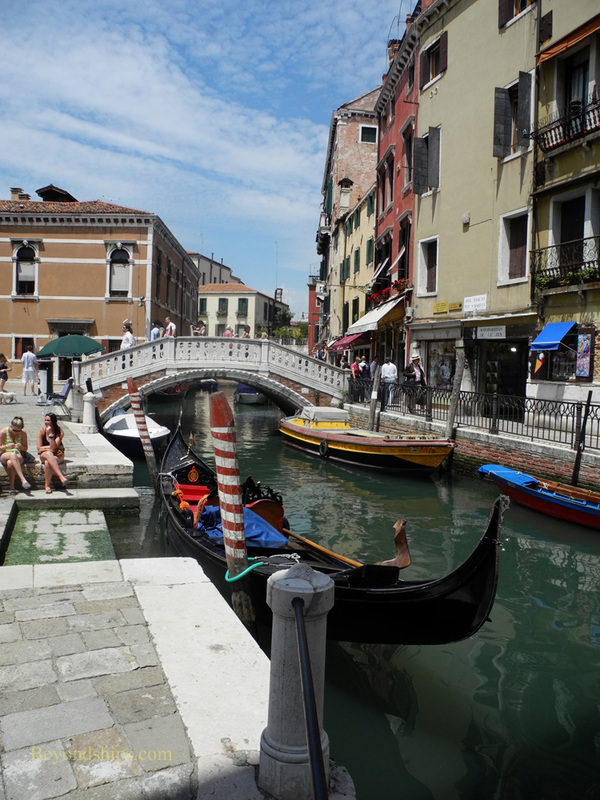 However, can you really say that you have experienced Venice without riding in a gondola? Besides it can be a unique and beautiful experience. Above: An antique gondola with a fetze. Today, all gondolas are 35 feet six inches long (about 11 meters) and four feet six inches wide (1.42 meters). They are made at specialized shipyards called “squeri” and have 280 component parts. Eight different woods are used in making the boat - - larch, lime, oak, fir, cherry, walnut, mahogany and elm. The oar is made out of beech. The gondolier stands in the back and rows from the starboard side. An ornate iron piece in the bow (the “ferro”) acts as a counterweight to the gondolier as well as decoration. 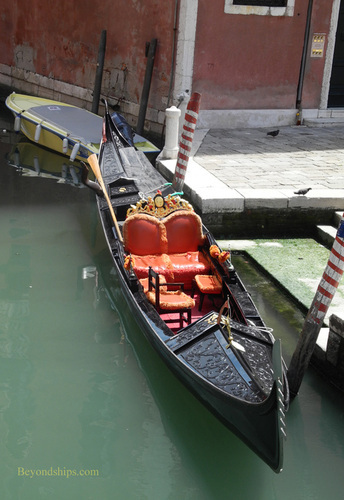 The gondoliers are licensed and must first go through a period of training and apprenticeship. In order to obtain their license, they must also pass an examination that covers Venetian history and foreign language skills as well as more nautical knowledge. Their singing abilities are not tested. Gondoliers are supposed to wear a striped shirt, black pants and a specific type of hat. 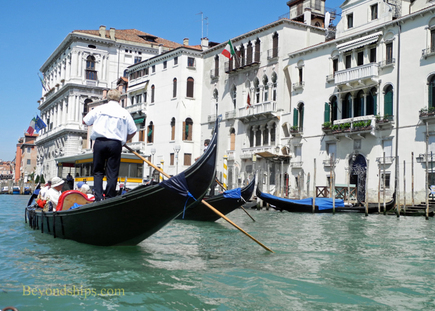 However, it is not uncommon to see gondoliers clad in street clothes. Being a gondolier is considered a prestigious occupation and it is not uncommon to have generations of gondoliers within a family. The first woman gondolier entered service in 2010 but it is still a mostly male occupation.